Common octopuses will collect crustacean shells and other objects to construct fortresses, or “gardens,” around their lairs. Other octopuses carry shells for protection. 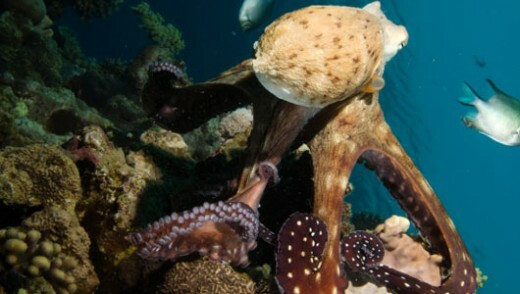 The common octopus has a wide array of techniques it uses to avoid or thwart attackers. Its first—and most amazing—line of defense is its ability to hide in plain sight. Using a network of pigment cells and specialized muscles in its skin, the common octopus can almost instantaneously match the colors, patterns, and even textures of its surroundings. Predators such as sharks, eels, and dolphins swim by without even noticing it. They have been found to play with a ‘toy’ and to have individual responses and individual temperaments, with some scientists believing they have individual personalities. All octopuses are venomous, but only the small blue-ringed octopuses are known to be deadly to humans. When discovered, an octopus will release a cloud of black ink to obscure its attacker’s view, giving it time to swim away. The ink even contains a substance that dulls a predator’s sense of smell, making the fleeing octopus harder to track. They also have beak-like jaws that can deliver a nasty bite, and venomous saliva, used mainly for subduing prey. If all else fails, an octopus can lose an arm to escape a predator’s grasp and re-grow it later with no permanent damage. Habitat: Octopuses divide into two types, the deep-sea finned octopuses and their finless, shallower water cousins. They inhabit many diverse regions of the ocean, especially coral reefs.